Glee star Chris Colfer adopted a brown tabby cat last Wednesday, April 11. “I adopted a cat today from the West Valley Animal Shelter,” Colfer said on his Twitter page. “His name is Brian, he’s 8 years-old, and 20 pounds!” The cat is said to be declawed. 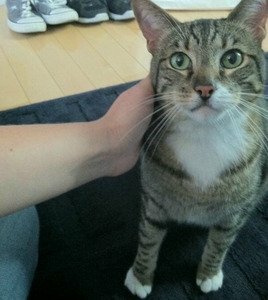 According to Peoplepets.com, Colfer adopted the cat while in the company of a female friend. Jesse Franco, an animal care technician who helped with the transaction, called Colfer a very nice person, adding that not a lot of people adopt older cats. Colfer won a Golden Globe Award for his portrayal of Kurt Hummel on Glee in 2011.